You have mere seconds to communicate your worth to a potential lead in order to keep them on your website. Don’t waste this opportunity with clutter, irrelevant information, or design fails. Develop copy (written text) that will convey your value to a potential client and organize the space so that it is clear and easy to use. I’ve seen so many websites designed without taking the end goal and user into consideration. One of my favorite examples of this is a newspaper who hired a fine artist to come in and give their website an artistic overhaul. The artist hid the menu, justifying this choice by comparing the uncovering of it to the similar action taken while reading a paper newspaper. OK, that sounds neat. No! It was completely inappropriate for a news website. It would make sense on a site in which there was some element of mystery and play, but not on a mass media site in which people come to quickly digest current events. A media site needs to be above all functional. Can you imagine going to your favorite news site and having to go on a treasure hunt just to find the menu? Now imagine over a half million new users coming to the site every month who have no idea that they need to hunt for the menu and instead think there isn’t one. Their impression of the site will be that it is unprofessional, frustrating, and they will dread having to ever go back to it. Tragic. Fortunately, there is a formula we can all customize to maximize the conversion potential of our websites. Let’s focus on the homepage content above the fold. This is the portion of the webpage that is visible on the screen when the page loads before the user scrolls or navigates away. The first thing your homepage needs is a professional logo and a branded color scheme. Don’t skimp here with a Fiverr logo – they are easy to spot and will cheapen your image. If you can’t afford a professional logo design, opt for a custom font that spells your company name and start a savings account to buy the professional logo later. A simple typographic logo (meaning your name typed out with a font without an illustration) is much more professional than the overly-detailed logos created by cheap designers. 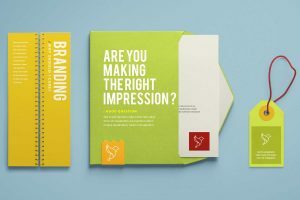 The color scheme is important for creating a mood and for making your brand memorable. Think red for Coca Cola, magenta for T-Mobile, blue for Facebook. Brush up on the psychology of colors and choose one or a few that are in line with your company goals and values. If you’re just starting out, less is more. You can explore adding more color later when you hire that professional designer to design your logo and branding. The next thing you need to have on the homepage of your website is simple, effective navigation. Use contrasting colors for the menu bar and font, and an easy-to-read font, so the potential client can easily find what they are looking for. Sans serif or serif fonts work the best in menus. This is not the time to be clever. Name your pages with accurate descriptions. Remember we are making it easy for the potential client to find what they need. Are you a local business? Include your phone number at the top right. Are you on social media? Include links to your social media pages at the top right, too. Include a link to your Contact page in the navigation menu. It really pays off to hire someone to do some custom professional photos or video for your site. You don’t want to look cheap with low quality stock photography or an amateur photo you took yourself. Exhibit your professionalism by looking professional. It pays to hire the expensive photographer or buy the expensive stock photography. You’re paying a one-time fee for a value added service or product. Think about ROI, return on investment, and how a better image will generate better results for your business! Tell the website visitor what you will do for them. How are you going to make their life better? How are you going to help their business? Avoid talking too much about yourself because they will be far more likely to seek your help if they can see how you will benefit them. Do some keyword research and make sure to use them here. This will help people and search engines find your site and classify it correctly. You can do this through a free Google Adwords account, by looking at related searches while searching terms, or by paying for a keyword software like Moz or Ahrefs. There isn’t that much room above the fold. If you included all the things listed above, you should be close to the bottom of the fold and now need something to encourage the user to scroll and view the rest of your homepage. You can do this with an interesting image or video that sits partially above and partially below the fold. You can also do this with an arrow pointing down – make it stand out visually or animate it with a bounce. Now we are below the fold, but homepage improvements don’t stop here! 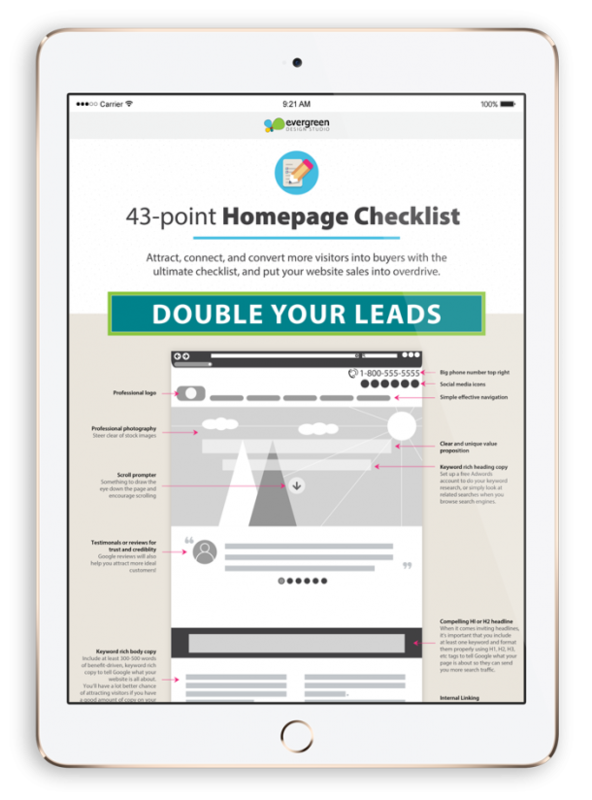 Here at Evergreen Design Studio, we’ve created a 43-Point Homepage Checklist to Increase Your Leads. You can download it for free by signing up below. 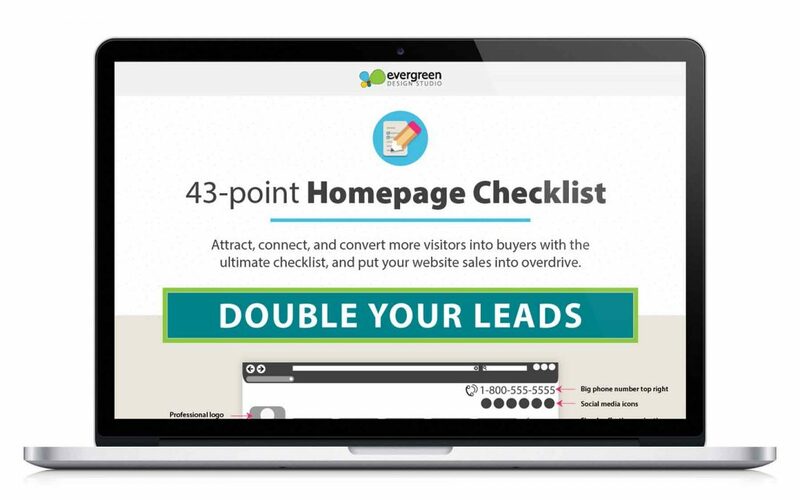 Sign up to receive the free homepage boosting checklist and as an added bonus you'll be subscribed to Evergreen's newsletter, which contains helpful tips, bonus content, and exclusive offers to help you grow your business! Success! Check your inbox for a message.